Dom Perignon, Moet & Chandon Imperial Brut Champagne, Caymus Special Selection Napa Valley Cabernet and Silver Oak Napa Cabernet are the featured wines inside this exclusive wine crate, joined by four more companion fine wines selected from our luxury wine cellar. Add even more prestige to your gift by engraving the top of the crate's lid with your own personal message. This timeless gift is destined to leave a lasting impression, while getting your recipient's wine cellar off to a stellar start. One bottle each of Dom Perignon Brut Champagne, Silver Oak Napa Valley Cabernet Sauvignon, Moet & Chandon Brut Imperial, and Caymus Special Select Napa Valley Cabernet. Four more bottles of fine wine are specifically chosen by our Sommelier for this wine crate. Due to availability and increased demand, the four additional companion fine wines are subject to change. Each Crate Measures 16.5" x 15" x 5". if ordered by 4:00 pm EDT Saturday April 20th. Lucky 8 Sommelier's Fine Wine Crate is a hand delivered gift. These gifts are delivered by one of our local design centers located throughout the United States and Canada. Same day delivery is available for most gifts when ordered before the cutoff time. 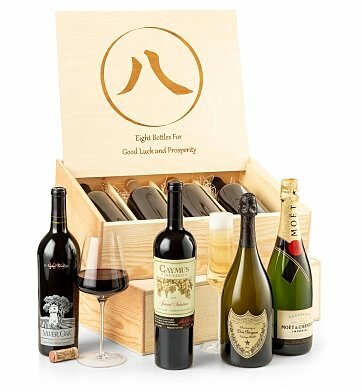 The cutoff time for Lucky 8 Sommelier's Fine Wine Crate is 1 PM in the recipient's time zone. Caymus Special Select Napa CabernetA highly regarded Napa Valley Cabernet comprised of the best barrels of the vintage, the Special Selection is supple, earthy, and ripe with lingering dark fruits. Silver Oak Napa Cabernet SauvignonDark garnet and bursting with ripe fruit, this California legend lives up to its reputation time and again. A complex and layered expression of California Cabernet, the wine has a dark garnet color and is bursting with fruit even as it is poured. It has a nose of cassis, violets, licorice, allspice and roasting coffee. On the palate, it has an extraordinarily rich attack, a satin texture and an exuberant expression of fruit on the mid-palate that comes from picking grapes at the peak of their ripeness. The wine finishes with notions of savory umami and fruit with a medium tannic grip. Eight bottles of fine wine including Silver Oak, Caymus, Dom Perignon and Moet. GiftTree signature wooden wine crate with the lid engraving of your choice.